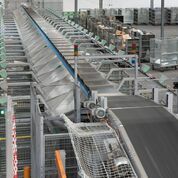 Sitma offers various sorter models, such as modular tilt-tray sorters which are very flexible (processing from small books to large parcels) and are easy to install; pocket sorters for single books and medium-sized parcel, where Sitma has developed the first systems for the distribution network of the publisher Mondadori. EasySort combines the quality and reliability of Sitma’s solutions with the flexibility and ease of installation/transportation, fulfilling the fast growing demand of the logistics market. Thanks to its specific design this is the ideal solution for shipping and contract centre services across multiple markets, with warehouse/logisitics hubs positioned in multiple locations.